BizyBeez™ 41-Piece Magnetic Building Set Discovered To Be Appealing To ADHD, Autistic and Special Needs That’s Creative, Educational and STEM Fun! Kaysville, UT (March 26, 2019) — There’s something really special about MagStix by BizyBeez ($69.99) as Amazon shoppers are discovering when reading the 5-star glowing reviews. First, unlike other magnetic toys, this 41-piece magnetic building set comes with a portable playboard that can be used as a building base anywhere — on the floor, table, or lap while traveling in the car. Second, the chunky tactile pieces give kids ages three and older a sense of calm and focus. That’s incredibly valuable to parents of children on the spectrum that love to zoom in on objects that are visually pleasing. Again and again, MagStix bright colors and rotating wheels lead to hours of quiet, brain-building play. Both Parents’ Choice Awards and Dr. Toy gave MagStix special attention with its honors. “We were impressed that the straight and curved magnet sticks have different tactile surfaces to engage the senses of both typically developing and special needs kids,” says the Parents’ Choice Foundation review. In fact, MagStix are certified by the prestigious STEM.org! 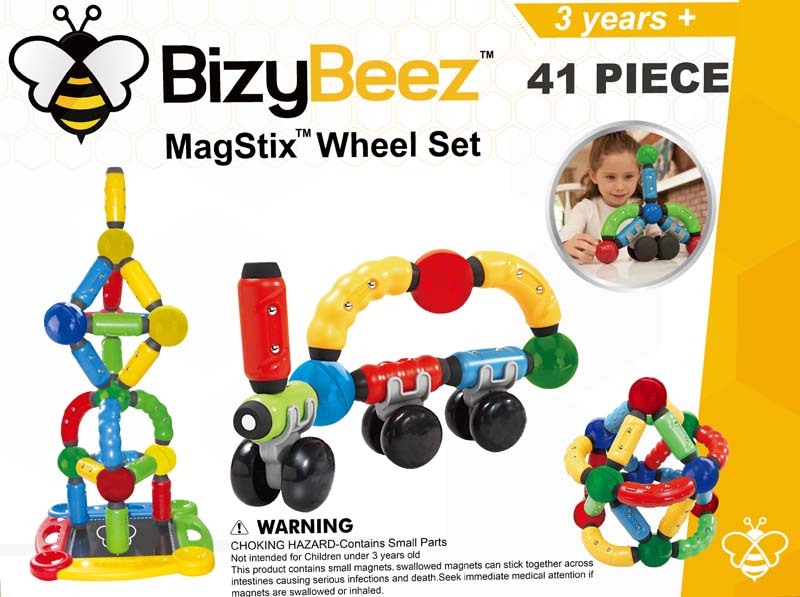 “BizyBeez’s MagStix excelled during our evaluation process, scoring in the top 84 percentile of over 1,100 STEM products reviewed since 2014,” declared Andrew B. Raupp, Executive Director of STEM.org Educational Research™. Made of safe, sturdy non-toxic plastic, the stacking pieces are easy to grip and squeeze. For grownups, the multi-piece set is durable and easy to clean. Snap-on wheels — included in each kit — take creativity to another level, allowing preschoolers and elementary-aged kids to create wildly imaginative trains, cars and other vehicles. When play is done, all pieces are tucked away in the bonus storage bag. 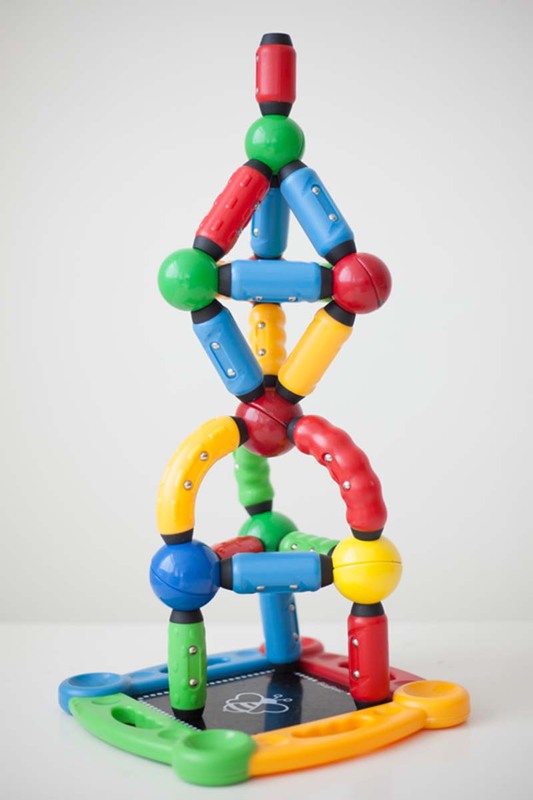 BizyBeez took special care to make sure the neodymium magnets chosen for MagStix were strong enough to allow kids to build large towers, but not so strong little fingers could get hurt. Siblings and older children love using multiple MagStix sets to test the limits of how massive and complex they can build their creations! Looking for a sensory toy that will engage your child while fostering cognitive development? The BizyBeez MagStix 41-Piece set features magnetized sticks and colorful metal balls that can be combined in an endless variety of ways with a simple click. MagStix Jumbo size makes them easy to grip and provide a proprioceptive input that is pleasing to both spectrum and sensory kids. MagStix proudly gives back 20% of the net profit from each purchase to a charity that supports special-needs children or humanitarian efforts around the globe. MagStix are currently available for purchase in the United States. They have been safety tested to meet European standards and plans are being considered for expansion into Europe in 2019. Join their mailing list and read their blog at https://bizybeez.com/ or follow them on Facebook and Instagram for what’s next for the busy bees in your house! BizyBeez was founded by homeschool parents of six children, Wade and Catherine Reed, as a project to train them in a real-world business experience. As a family, they sat down together and worked on the mission, vision, and values of the company. Together they selected a product category… magnetic toys. MagStix evolved from that meeting. Watch, shop or learn more at https://bizybeez.com/.